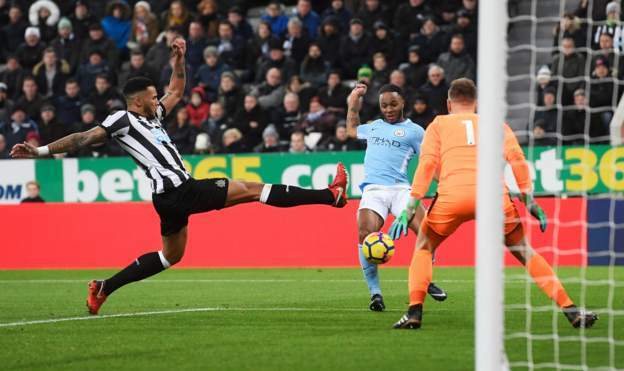 Manchester City beat a negatively set-up Newcastle United side 1-0 at St. James’ Park, with Raheem Sterling’s first-half goal proving to be the difference between the two teams. City have been incredibly clinical over the course of their 18 game winning run, but struggled to put a battling Newcastle side out of reach. That the Magpies managed to keep the leaders to one goal, something only two other teams have done, is testament to their defensive quality, but a lack of creativity was evident for a team that has struggled to score goals all season. Manchester City’s dominance was clear from the outset, with Sergio Aguero hitting the post just six minutes in, and Rob Elliot pulled off an incredible save from an Aguero header minutes later. City’s Argentinian talisman threatened the Newcastle goal throughout the first-half, and struck the post again with a curled long-range effort, before seeing a low shot blocked just before the break. For once, City were initially struggling to create opportunities, such was the defensive outlook chosen by Rafa Benitez, but their valiant defence wouldn’t last much longer, as Raheem Sterling opened the scoring. One-two’s have become a trademark of City’s swashbuckling style this season, and de Bruyne received the ball from Sterling, before chipping it back into his path majestically. The English winger, who’s been revived under Guardiola’s stewardship, volleyed the ball in tidily. Newcastle opted for a change of approach from this point, and Nicolas Otamendi had to rescue his side, clearing off the line heroically after a defensive error from Kyle Walker. To say Newcastle competed in the second half is perhaps a touch too far, but they were able to foil City’s plethora of attacking options. In truth, Ederson’s goal was never threatened, though Benitez rolled the dice and brought on Dwight Gayle and Christian Atsu. Gayle did have a late opportunity to equalise for Newcastle, but he placed his header wide of Ederson’s goal. It was a rare chance for the Magpies, but such openings have to be capitalised on if City’s unbeaten run is to be halted in the second-half of the season. Though it won’t bother Pep Guardiola greatly, his Manchester City side missed out on the signing of Virgil van Dijk, as it was announced that the Dutch defender would join Liverpool in a £75 million deal earlier in the day. The problem for Guardiola lies in the fact that Vincent Kompany just cannot stay injury free, and van Dijk would’ve been a perfect replacement. The Belgian has played just 33 games over the past 3 seasons, and went off early with a suspected calf injury at St. James’ Park – his 39th career injury. It wasn’t such a dominant performance from the League leaders, but over such a hectic Christmas period, victory is the most important thing. Should City come through unscathed, as is expected, Pep Guardiola could be forgiven for celebrating the title victory early.